We enthusiastically attended the first edition of 360by360 Competition last december and now everything is ready for the 2nd edition. 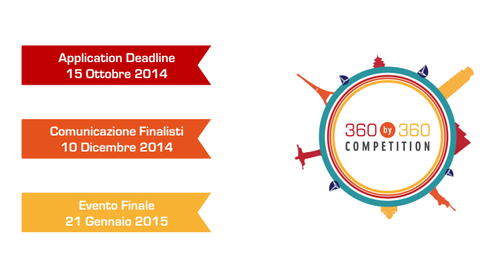 360by360 is a Startup Competition sponsored by 360 Capital Partners which aims to support the Italian innovation system. The startup winner will receive an investment of $ 360,000 becoming part of the portfolio of 360 Capital Partners. The Call-for-Ideas is open from the 20th June to the 15 th October 2014 and is addressed to all the startups operating in the following sectors: Digital, Industrial & Cleantech and Medical Devices. The entrepreneurial projects must have the operational headquarter and corporate office located in Italy. The 16 finalist will have the opportunity to pitch in the final event. This event will see an audience of selected partners which includes primary operators in the Italian innovation ecosystem such as incubators, seed accelerators, Poly Scientific Technology and Business Plan Competition organizers. The finalists will be directly selected by 360 Capital Partners among the applicants on the dedicated website. It is possible to apply even for the startup already incubated by the Partners. The communication of the finalists will be on 10th December 2014. On 21 th January 2015 every startup will have 15 minutes to explain the project through an elevator pitch. After the pitches and the sessions of Q&A, the jury will unveil the winner. Last year the competition was won by Charitystars (read out interview) of Francesco Fusetti, an amazing speaker also during the first edition of TedxPadova. However, 360 capital partners has also invested in another finalist of the past edition. In fact 360 Capital Partners invested € 500K in Jobmetoo, an Italian startup which aims to revolutionize access to employment for people with disabilities. Among the startup finalists of the previous edition we remember also: Buzzoole (read our interview) that raised € 180K by Digital Magics and D-orbit of Luca Rossettini, who recently speaked from the TEDxCafoscariU’s stage. 360 Capital Partners operates in the Venture Capital industry and it count 65 years of experience in this field. It has invested in over 80 companies from seed to pre-IPO stage leading to success brands like Yoox and MutuiOnline. 360 Capital Partners has a long experience in supporting the internazionalitation of the companies. It operates in Europe but it has a focus in Italy and France. 360 Capital Partners has already invested in the areas of Digital, Cleantech and Industrial & Medical Devices. The team of 360 Capital Partners has raised over € 300M from domestic and foreign investors. Good luck to every applicants! UPDATE: due to the high number of applicants 360 Capital Partners decided to postpone the application deadline to 31th October: so hurry up, you still have time!